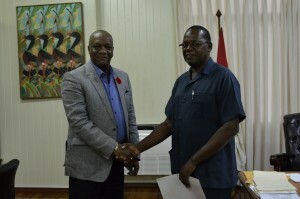 Minister of State, Joseph Harmon (left) and Retired Assistant Commissioner, Winston Cosbert. Retired Assistant Commissioner of Police, Mr. Winston Cosbert was Wednesday evening given the Terms of Reference (TORs) by Minister of State, Mr. Joseph Harmon, to probe into the allegations of unauthorised disclosure of information, mismanagement and malpractices in the procurement of pharmaceuticals at the Ministry of Public Health, government announced. In handing over the TORs, Minister Harmon said that Government eagerly awaits that Report and the findings, so that appropriate action can be taken. “I have the confidence in your ability; I have seen your work before and you have done inquiries before. I look forward to the report. This is an important inquiry … and when you have to go after these things, you have to have evidence and facts [because] Government cannot act on innuendos and hearsay. We have to have an investigation and based on that, the Government acts,” the Minister said. The Board is expected to investigate, examine and report on the “procurement and management processes by which the Ministry of Public Health awards contracts for the procurement of pharmaceuticals, and services and supplies to bidders. It is also expected to investigate the procedure which exists to identify and control the unauthorised disclosure of price sensitive information in the procurement of pharmaceuticals and how and when did the Ministry of Public Health become aware of these disclosures and what actions, if any, were taken by the Ministry. After the investigation and findings, recommendations must be made for measures that could strengthen information management systems within the Ministry to improve the handling of protected information and deter any unauthorised disclosures; and remedial actions, or any other actions, against staff who are found to have acted improperly in the discharge of their public duties and those persons who have benefited from the actions of the public officials and for criminal prosecution or other actions, if any, against any such person found to have been engaged in criminal or improper conduct.